Legendary Gunslingers is the latest volume in our series of class-focused player supplements, this time focusing on the most explosive marksmen in the game: the thrill-seeking daredevils known as gunslingers. This base class, introduced in the Pathfinder Roleplaying Game Ultimate Combat, was a class designed to be master the art of firearms, a new and interesting weapon type presented for the first time in that book. Legendary Gunslingers expands the gunslinger even further with a redesign of the class with amazing new customization options to hit the bullseye every time, like over 30 new Gun Mastery techniques to reload faster, avoid misfire, unlock new deeds, and enhance your shots in exciting ways. In addition, over a dozen new archetypes help tailor your gunslinger to any kind of specialty, from heavily armored Living Turrets to Alchemical Hotshots plying their metallurgical arsenal, Faded Strangers that truly disappear from memory and sight, doom-bringing Muzzle Roarers, dissolute Rumslingers, and deadly Firearm Strikers helping you to blend martials arts with spectacular gunplay. Plus new feats, magic items, favored class options, and more! Brought to you by the terrific talents of N. Jolly, Jason Nelson, Clinton J. Boomer, Robert Brookes, and Alex Augunas, pick up this 38-page expansion to your Pathfinder Roleplaying Game campaign today and Make Your Game Legendary! This installment of the player-centric/class redesign books clocks in at 38 pages, 1 page front cover, 1 page inside of front cover, 2 pages of editorial, 1 page ToC, 2 pages of introduction, 2 pages of SRD, 1 page advertisement, 1 page back cover, leaving us with 27 pages of content – as always for Legendary Games, these pages are packed with materials, so rest assured that there’s a LOT of content within! 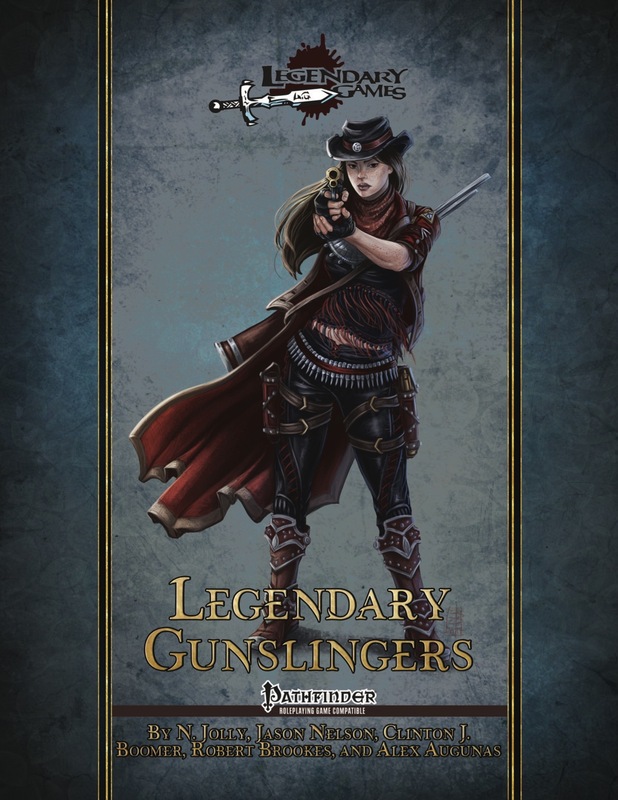 Now, I’ve been pretty vocal about the copious issues that the gunslinger class has, so let’s start with the big selling point of this pdf – the Legendary Gunslinger base class. Now, in an interesting aside, the pdf already shows a level of care absent from many comparable files: The class table does come with a short note that allows groups that do not operate under the assumption of firearms targeting touch AC to make full use of it. It’s a small thing, but it’s the kind of “going the extra mile”-mentality I really appreciate. Now, let’s take a look at the chassis: Legendary Gunslingers are proficient with simple and martial weapons as well as with all firearms and light armor, get d8 HD, and thank the 7 heavens, they actually get SKILLS. 6 + Int mod per level. And yes, these include Swashbuckling staples like Acrobatics, Bluff, Swim, Stealth, etc. The chassis of the class is also interesting in that it implements a change I have always been pretty vocal about: The gunslinger does NOT need full BAB; targeting touch AC for the most part makes math wonky at high levels for full BAB characters. Thus, the legendary gunslinger gets ¾ BAB-progression as well as good Fort- and Ref-saves. The legendary gunslinger gets a blunderbuss, musket or pistol at first level and this weapon may only be sold for scrap; other creatures treat it as broken. We also get Gunsmithing, however, ammo etc. may be crafted for 1% of the base price. This means that legendary gunslingers no longer break the bank of really gritty low level groups. Also at first level, the legendary gunslinger gets to add Dex-mod to firearm damage, though this bonus damage caps at class level until 5th level. (this ability is called “gun training”, fyi.) Additionally, misfire values are reduced by 1 to a minimum of 0, and broken firearms only increase misfire values by 2, not by 4. Grit is still governed by Wisdom modifier (minimum 1). A really big plus here would be that the legendary gunslinger’s grit-recharge mechanics allow for the regaining of grit via successful saving throws. And before you ask: YES, this is utterly and remarkable cheesing-proof. No chance to abuse it whatsoever. Big kudos! At 2nd level, we get +1/2 class level to Perception, and choose two Int or Cha-based skills and use Wisdom instead as governing attribute. With the skill-array, this makes gunslinger faces very much possible. Nice! Also at second level, we get a significant alteration as far as design paradigms are concerned: We get the first so-called gun mastery, with every 3 levels thereafter granting another one. Yes, this means what you think it means: The class, finally, actually has meaningful player-agenda and build-diversification built straight into its chassis. Some deeds have been transformed into gun mastery and now require a conscious decision to get – like Charging Shot, or Counter Shot. As an aside: The latter now actually is balanced by the alterations of the gunslinging chassis in a more meaningful and exciting manner. The placement of these masteries as far as minimum levels are concerned btw. makes sense. A particular joy, at least for me, would have been to see that improved and expanded targeting add to the targeting deed. And yes, you can get renown! The gun masteries presented are extensive, interesting and yielded no issues in my tests. 3rd level yields uncanny dodge, and 13th level improved uncanny dodge…while also providing the deed mechanic! So yes, legendary gunslingers still retain basic deed functionality; it’s still very hard to make a truly sucky character with the engine proposed, and the choices that are still automatically granted thus make sense. 7th, 11th, 15th and 19th level unlock new deeds in this linear progression. 4th level nets nimble (improving it by +1 every 4 levels thereafter) and combat grit: This nets you a temporary grit point whenever you roll initiative. This does have a cooldown and can’t be cheesed, while making sure that you always have at least something to do. 5th level lets you spend 1 grit as a swift action for +1 to atk and damage for 1 minute, with the bonus increasing by +1 at 10th level and every 5 levels thereafter. 6th level nets the skill unlock of a Dex or Wisdom based skill (including ones where the gunslinger may have substituted Wisdom for Cha or Int), and 6th level allows for a grit-based reroll of Dex-or Wis-based skill checks. This improves at 17th level. 7th level nets evasion, 16th improved evasion. True grit is the capstone. We also get two alternate favored class options for all races: +1/6 gun mastery or +1/5 combat grit. The pdf includes no less than 15 different archetypes for this class, so let’s take a look at what we get, shall we? The alchemical hotshot loses deeds, but does get alchemy at minus 1 extract per level and is Int-based; the massive key feature here would be that the archetype learns metallurgy, which has two benefits per entry: One is the special type of bullet, and one allows for a firearm made from the material. Lead, for example, can temporarily lower SR, while copper bullets can prevent targets from attacking the alchemical hotshot. And yes, you get to go Golden Gun at higher levels; heck, you even get a platinum gun!! The archetype pays for this flexibility by losing some of the spontaneous tricks – it is Int-based, so requiring a bit more deliberate planning is perfectly in line with the concept here. Damn cool. The anthem gunner is basically a bard lite/legendary gunslinger hybrid that is Charisma-based and as such, has a lot of its class features tweaked accordingly. The black flag bandit is locked into pistols and represents a pistol + blade/siege weapon specialist. They can make siege weapons require smaller crews, which, in some campaigns, can be super cool. The bullet wizard once more would be an Intelligence-based archetype, using the starting weapon as a bonded object and gaining a magus’ spellbook. The archetype makes delivering spells via bullets work (this is pretty hard) and may, at higher levels, expend spellslots to fire energy blasts from the weapon. This made me smile, for it does resemble to a degree the concept I implemented in my own etherslinger class, though obviously with a different base spellcasting engine. Nice job!! Don’t like firearms in your game? Take a look at the crossbow killer archetype. Big kudos: This fellow does come with a bit of advice regarding multi-archetyping it. The Demolition soldier is locked into a pistol and gets scaling bombs. Nice. The faded stranger is the faceless guy that folks may forget about after meeting them, the subtle infiltrator – I liked this one, though I did wish it had a silencer-style ability baked into its rules. The firearm striker is an unarmed/gun-fu-ish specialist that blends unarmed strikes and firearms. This is traditionally either really bad or really broken – this is neither, though it probably would have made for a viable class hack. The option to follow firearm shots with unarmed strikes, including movement, is interesting. The living turret gets a culverin and may enter a special stance as a move action, improving defenses and counting as supported. Interesting: This does offer some tanking capabilities. Cool engine tweak! The muzzle roarer is one of the big archetypes: Born under a really bad sign, these guys may neither be good, nor lawful, and they must serve an evil patron deity or entity akin to demon lords, horsemen of the apocalypse or Great Old Ones. They have slightly less skill points per level, but do get an oracle curse, with additional spells codified as limited use SPs instead. With a Rovagug-y theme, they can shatter inanimate objects. They also may choose ninja tricks and rogue talents instead of gun masteries – and yes, grit is employed instead of ki, where applicable. Their firearms become particularly loud, making noticing them easier, and they may use grit to duplicate magical sonic based effects. Finally, the archetype gets a couple of nice, or rather, unpleasant evil deeds. The pale slinger replaces nimble with an aura of misfortune, from which she may exempt allies, and hexes and hex/shot synergy are neat. I also enjoyed the unique benefit that prevents rerolls in the auras of higher level pale slingers. Rather cool one! Rumslingers only recover grit by drinking alcohol, replaces nimble with a synergy trick for Fort-bonuses to resist poison by imbibing alchemical fire. 2 unique deeds and a really evocative capstone complement this interesting engine tweak. Sky riders replace the resolve ability sequence and slinger’s quirk with a bird animal companion. The archetype also gets wild empathy and upgrades for monstrous mounts later. Solemn travelers may not be true neutral and instead get an alignment-themed cavalier mount, with later detect-SPs added. Judgments and an aura that penalizes fear-saves and negates fear immunity complement this one. Finally, there would be the technological shootist as the final archetype – you guessed it: This fellow would be the Tech Guide engine tweak for the Legendary Gunslinger. Nice one! The feats within the book number 6 – Deed Specialization nets +2 DC for a deed’s save DC. Extra Gun Mastery nets, bingo, a gun mastery. For Demon-Haunted Drifter, you need an eidolon and may instantly call forth the eidolon or lesser evolution surge it via grit, which is cool. Kudos: Notes for use are provided for gamers with less system mastery. Guns Out of the Grave takes up almost a whole page and is a feat that is only available for the undead. The feat nets you rejuvenation while you have at least 1 grit, and the feat nets special abilities depending on the HD of the user of the feat. Obviously intended for NPCs, this makes for a truly fearsome feat for the undead, allowing the undead to call their weapons back. I’d obviously strongly advise against making this one available for PCs in all but the most potent (or apocalyptic) of campaigns. Whiskey-Soaked Drifter is once more a HUGE feat, one that makes the character basically an alcoholic, but allows for temporary grit gains via drinking alcohol. Minor nitpick: There is a reference to “grit” that should refer to “drunken grit” instead, making the second paragraph here slightly confusing. This feat is one I really like in theme, though the execution will not be for all groups. Since this reliably delimits grit, it requires some mature handling by player and GM alike. The Winter-Hearted Drifter feat is one that makes you an arctic specialist/one associated with entities of cold/etc., providing synergy with the Winter Shade of the Umbral Wood feat. While high-concept, these long-form feats do need a bit more careful consideration than the rest of the pdf. There also is a page of nice firearm modifications – 8 to be precise. And yes, thank all 7 heavens, a silencer’s included. Gunslingers can now, you know, not insta-break any infiltration scenario. Huge kudos. The pdf also includes two magic items, the farsight duster that enhances range-increments and the lore bullet, which, while kept on the person of someone with deeds for 24 hours, nets the gun mastery inscribed within. There is a hard limit on how many of these you may carry. The pdf ends with a cool NPC, Theresa Diaz. She and her lover were enslaved by Nigredo, a neurokineticist and brother of Theresa’s lover, who had a …weird way of showing affection. Theresa now is looking for Hannah, lost somewhere out there. Nice way of tying stories together. And yes, we get a proper boon for this CR 7 lady. Editing and formatting are excellent on a rules-language level; on a formal level, the pdf is similarly precise, though I did notice a couple of installments of bolding missing. Layout adheres to the 2-column full-color standard of the series, with artworks being a blend of old and new full-color pieces. The pdf comes fully bookmarked for your convenience. N. Jolly, Jason Nelson, Clinton J. Boomer, Robert Brookes and Alex Augunas know what they’re doing. Siobhan Bjorknas, Blake Morton, Hal Kennette and Jason Nelson in development did definitely polish this to a shine. So…ähem…you know, the longform feats…I’d have preferred them in a Legendary Villains installment. Öhm. Yeah. Those firearm mods? More would have been cool. Öhm. Yeah. Who am I kidding?? This is the masterclass gunslinger that I always wanted. Meaningful differentiation, sensible design decisions that are grounded on a deep understanding of rules and obvious playtesting, high-concept options and an all around better playing experience? HECK YES. This is what the gunslinger always was supposed to be. It’s a rewarding, evocative, fun class that does pretty much everything resoundingly right, with the minor manabar-y combat grit making for a bold and cool engine-change. Add to that the skills, the expert ways to prevent abuse, and we have a masterpiece of a class redesign. My final verdict will clock in at 5 stars + seal of approval. Oh, and since I only got around to reviewing this right now, this is definitely a candidate for this year’s top ten. A must-own offering for any group including gunslinging – get it and never look back. A quick note: the prior reviewer misread the Anthem Gunner. As written: "If an anthem gunner fails to sing or make an attack with her firearm while her song of strife is active, it immediately ends, regardless of its remaining duration." This ability ends if the anthem gunner does NOT fire that round. Otherwise, though, the Legendary Gunslinger class presented in this book is 3/4 BAB (instead of full), and gains Gun Mastery abilities, which are feat-like functionalities that make the Gunslinger even *more* the master of the gun. This book is a must-have for anyone who loves the Gunslinger class. If any of you are familiar with the Legendary Heroes line you'll largely know what to expect here. Following a recent trend of redesigning some of the more problematic Pathfinder classes into something more managable and exciting, the Legendary Gunslinger captures the theme and fatasy of the class much better than the original. While it looks at first glance to be a downgrade with having only 3/4 BAB, the class comes out stronger for it and doesn't lose anything that it will miss. Gun mysteries allow for much more customization for your gunslinger, allowing you to feel differenet than ohters of the same class. It is a thoughtful and precise redesign that I'll be suggesting to anyone who was dissapointed in the original class. The suplement's only real weakness is the archetypes. They range from incredibly reliant on flavor without giving any good benefits (Faded Stranger) to not seeming to function very well at all. The latter issue is very aparent in the Anthem Gunner archetype, which I very much wanted to like. As written though, it provides a weaker version of inspire courage for less of a duration and if you shoot your gun during this time, the effect ends. I'm perplexed as to what the Anthem Gunner is meant to do during this time, since shooting a gun is literally the main point of the class. Some of the archetypes hit their mark expertly, like the Pale Slinger and Corssbow Killer, which makes the weaker archetypes even more dissapointing. Overall I do recommend this book to anyone who wants to shake up gunplay in their campaigns. The legendary version of the gunslinger alone is worth the price of admission and while some of the archetypes flag behind the book as a whole is a great addition to anyone's Pathfinder library. Looks like it's time for my dev post here. So I have strong opinions on guns in fantasy, and most of them are that I like guns in fantasy. The original gunslinger had a lot of potential, but felt like it wasn't evolved enough from its alternative class roots. Thus, I decided to drop it down to a 3/4 BAB class to better mesh with the touch attack nature of guns and to further differentiate it from its original fighter heritage. Add to this that I thought while interesting, deeds didn't go far enough for customization, so I added gun masteries. Gun masteries are to make sure your slinger feels even more unique, as well as making guns more than just another weapon for a legendary gunslinger. Not only this, but the legendary gunslinger is far more adept as a skill character, having more potential with their skills, things like slinger's quirk allowing them to be even more Wisdom focused, and even getting rogue skill unlocks help make legendary gunslingers a far more interesting class outside of combat while gun masteries help them be more interesting in combat. With combat grit, your grit will last longer in battle in addition to having quite a few more reasons to use it, making everything far more dynamic. There's even new FCBs to help players customize their characters even further. Alchemy and guns are like peanut butter and guns; they're awesome. Alchemist 'casting' along with interesting metal replacement options for your bullets will help you play a real alchemy themed gunslinger. From lead to platinum, new options are the order of the day, each type of metal having different effects. For those who want to make that boom count, this is a mix of bard and gunslinger that helps people really play up the leader role in combat, as you're given options to play a combat maestro who can turn the tide of combat through bonuses given by your songs punctuated by gunfire. Guns and pirates are best friends and with this archetype, you can fully play up the captain role while having new options for while on ships. Hell, you can even use cannons better, the most powerful of firearms. Stuffing magic into a gun and firing it out is how this archetype rolls, allowing one to play a ranged caster with all the same power as a gunslinger. Have fun infusing bullets with spells or even raw arcane energy and blowing people to pieces. We did need a new bolt ace, and this archetype is intended to be as unintrusive as possible in this way. There's even rules for allowing it to stack with archetype which it normally may not, so you can enjoy just about all of the content in this book without even a hint of black powder if that's your kind of game. What's better than just blackpowder? Blackpowder and bombs! A small archetype that gives the ability to add explosives into your arsenal as well as fire massive bomb bullets for even bigger kabooms! For those of you who are 'just passing through', this archetype allows you to pass through people's memory, being nothing more than a shadow of the past. Perfect for those who want to lose themselves in the sands of time. This archetype can be a little tough to grasp until you get the Yang of it, but if you're a fan of gun fu and other flashy forms of combat, you'll most likely find something to love here. Mixing martial arts and melee, combat is entirely unpredictable when you can switch styles on the fly. Sometimes you just want to stand behind a huge gun and fire, and this archetype is perfect for that. Allowing you to be a tank with the cannon to match, this is one of the few times that using the larger firearms will not only be viable, but preferred. I love (bad) luck as a concept, and the pale slinger works with that super well with things like hex infused bullets and their aura of misfortune. While not exactly the most party friendly, they certainly can help completely shut down foes with bad luck. Mobility's a big issue for gunslingers (or at least WAS), so I thought giving them a flying mount would basically solve every issue ever. Plus flying around on the back of a griffin with a shotgun is the best. Playing up more the lawman role (despite being alignment agnostic), this is the archetype for those who really love traveling with a sense of purpose, just them and their steed. Because there's guns in the future, and you need to know how to use them. Basically our tech archetype, this helps make sure that you know how to use a blaster when absolutely needed. To me, firearms not having modifications initially was a huge oversight. They're such complex weapons that they should be able to switch out parts, and they try to use (some) of the rules for those presented in Adventurer's Armory 2 while keeping them more user friendly, such as not changing their proficiency level and allowing two mods instead of just one. There's a lot of obvious choices like silencers, short barrels, and sights, but probably my favorite is integrated weapon, which allows you to integrate a firearm into a melee weapon. So yeah, gunblades. Looping back around to Legendary Kineticists, Theresa's a character I've wanted to write up for a while, linking her back to Mindfang and her brother (who does have a name) as well as leading into a different project that I'm really excited about. This was a project which I hadn't expected to have nearly as much of a hand in as I did, but once I got into the spirit of it (gun masteries certainly helped), it really started to grow on me. Guns in fantasy are always something I enjoy, and giving people dynamic options to play things is my passion. I love hearing when people use something I've written to do something amazing, and Legendary Gunslingers was made to give people those 'OMG' moments. I hope it lives up to your expectations! Lots of great stuff in here from Jolly, Boomer, Robert, and Alex, plus some from me! Looks like Legendary Brawlers will be next week instead of this week, but the FIGHT CLUB WILL CONTINUE!!! Looking forward to that one, too. The Brawler struck me as a way to do everything from a bare-knuckles boxer to Bane to Tarzan to Popeye the Sailor Man, and it'll be interesting to see how LG handled it. Hey you can talk about it... you just GOTTA FIGHT! For those who are interested in checking out the content of the book, it's just been added to the Gunslinger guide. Odd question: with the Legendary Gunslinger reduced to a 3/4 BAB, was their per-level HP die also reduced to a d8? As I recall that's the norm. It was in fact also lowered, as we wanted to keep the HD=BAB the same, so the class does have slightly less survivability but a ton more utility, such as ways to shut down spellcasters and fire a gun in water. "The attack action is a rarely used yet normal part of the game, it's used for things like vital strike. An attack action is a standard action, but because of being an attack action, can be used with the vital strike feat as well as other abilities." Is this PFS legal to play, and try? I would assume this has been written in accordance with the paizo rules on open game license as I have seen a number of other pathfinder compatible materials. This looks amazing I am very interested in trying some of these options out soon. I was a huge fan of the Iron Kingdoms books for 3.5 and this fits with that steampunk western feel that I enjoy running as a GM. I think Gonz is referring to Pathfinder Society Organized Play, not the OGL. Since this is from a 3rd Party Publisher I doubt it will ever become allowed within Organized Play. It is from a (in my estimate at least) a well respected 3rd Party Publisher that usually features the contributions of many talented designers (or whatever title you like to go by) with some that contribute or work for Paizo. If you get to play Pathfinder outside of PFS, check with the GM to see if they allow 3PP stuff, some don't allow it at all, for whatever reason. Thanks a lot, that was definitely a vibe I was looking to capture here, as Iron Kingdoms is something I like a lot (even if I barely know anything about it), and for this rebuild, I really wanted to give options that would fit into a more 'gritty' world, pardoning the pun obviously. And yeah, sadly this isn't PFS legal, as there's no allowances in PFS for 3rd party material. Now available as a bonus add-on, along with the sharp-shooting, curse-casting Legendary Hybrids: Deadeye Hexer, to the amazing Pirate Campaign Compendium Kickstarter! My one issue with this is not everything in it is "Standard Gunslinger friendly." I did notice some archetypes, thankfully, were but not all of them. How would I make Alchemical Hotshot, Pale Slinger, Firearm Striker, etc. with a Standard Gunslinger? Those options would have been great. Thanks for the great review, Endy! We're glad you enjoyed it so thoroughly!